More harp duets are on the way! For the last two years I have been collaborating with Sharon Thormahlen on another duet book. It all began in the fall of 2014 when I was visiting Sharon and her harp-building husband, Dave, at their home in Corvallis, Oregon. We ventured outside on a rainy afternoon to see the sun peeking through and a large double rainbow arcing in front of us. In our book are three original tunes, each one different and special to us: Under the Double Rainbow, Prelude for Peace, and Hermosa Mariposa. Over the Rainbow opens the book and incorporates both the traditional version and the "IZ" version of this well-loved tune; it was fun trying to make my harp sound like a ukulele! Also in the book is La Chanson de Claudine, a beautiful tune we found and felt blended well with this music. Once again, Afghan Press will be publishing our duet music. We expect it to be out in late July 2016. The purchase price is $25. Please contact me if you wish to order a copy! (206)914-2662 or anna@peaceharp.com. Sharon Thormahlen and I collaborated on these tunes as we traveled to harp gatherings of various kinds between 2006 and 2012. Our arrangements are all in two parts and are ideal for beginning intermediate, intermediate, and advanced intermediate harpers/harpists who enjoy playing together! 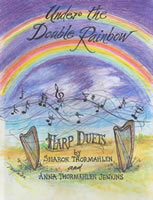 All the scores are included in the book as well as larger-print Harp 1 and Harp 2 parts. We were careful to make this book "page turn friendly" (repeats and page turns in best possible locations). Both the scores and parts come with suggested dynamic markings, lever change indicators, rehearsal letter markings for ease in learning and performing, and chord symbols. We also included tempo markings, introductions and ending codas, making these tunes ready for your performance! Email me at anna@peaceharp.com if you want to order a copy of Cabin Fever for Two! Or phone me at (206)914-2662! Contact me by email at anna@peaceharp.com if you wish to purchase this CD. If you wish to purchase Prelude for Peace, contact me at anna@peaceharp.com or order it from Afghan Press.